Most of today I spent wondering what to do for dinner. I made a Thai red curry last Friday and there was one small portion left. I hadn't taken out anything from the freezer this morning either. On top of that we've run out of bread, so beans on toast were not an option either. For a short while I toyed with the idea of butter bean salad, but it would still need a night for all flavours to release. So walking into the larder, I spotted some cans of fancy beans I'd bought some time ago and I clicked - beans plakia. The "plakia" (BG: плакия) I rather suspect originates from the Greek plaki, which means baked in an oven, according to Wikipedia and Rick Stein. In Bulgaria, this means baked in an oven with tomatoes and lemon. Needless to say, I didn't have lemon in the house, but had some of the lovely pepper-chili paste still from the imam bayildi I made a couple of weeks ago. Also since I had canned beans, I didn't need the cooking phase where celeriac, parsley root and a bay leaf provide interesting flavours. So all in all it was something fairly different from the beans plakia that I ended up with, but it was very tasty indeed. Would work fine as a main meal for a vegetarian or as a side dish with something grilled I think. Lundulph says that chicken might get lost in it. I think it might just about work though. Drain and rinse the beans. Lay out in a deep baking tin. Preheat the oven at gas mark 6 (220 degrees C). Peel and slice the carrots and lay on top of the beans. Drain the tomatoes into a jug, add the red pepper paste, parsley, lemon juice, salt and pepper to the juice and stir in well. 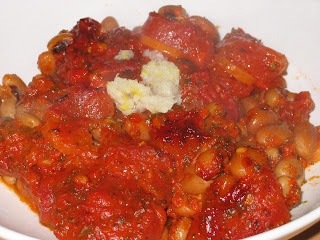 Slice the tomatoes and lay on top of the beans and carrots. Drizzle the oil over the dish, then cover with the tomato sauce. Give it a shake, so everything is covered with the tomato sauce. Bake for 45 minutes in the middle of the oven. Peel and press the garlic in a small bowl. Pour vinegar on top and leave to stand while the beans are cooking. In fact any type of beans would work, I had some doubts about the Borlotti and Pinto ones because they looked the same, both on the label of the cans and when I opened them. All had a floury flavour. The garlic condiment is optional, but is recommended with lots of Bulgarian dishes, mostly soups. I used to like to dip bread in it when I was little, but then I do really love garlic. It's quite stong flavoured and smells even stronger, store wrapped in at least two plastic bags! The other day I made meringue again, this time using the Swiss method, which according to my Larousse Gastronomique, is the preferred method by professional chefs as it is stable enough to last a few hours in the fridge. The method is to mix the sugar and egg whites together over a water bath, i. e. a bain-marie or a double boiler. This sounded a bit complicated to me, but it's not, in fact the mixing of the meringue works so well, it's quite fun and I immediately decided to never make any French meringue ever again. This time I also made a few changes to my recipe and now I realise despite my impulsive decision, that I have to give French meringue one more chance. This time I used a stainless steel pot for the mixing. From researching on the Internet, a copper bowl is the ultimate to use as there is some fine chemical reaction between the egg whites and the copper that makes the meringue more stable and that stainless steel is the best substitute for this. You may be able to get away with glass bowls, but definitely not plastic ones, as despite thorough washing, there tend to be some small residues of fat which ruin the meringue. The other thing I changed was that I used caster sugar (as most recipes recommend) rather than icing sugar. I was surprised that it did dissolve, I'd expected it to remain in small crystals. The third change was to separate the egg whites and leave them on the kitchen top for about an hour and a half to bring them up to room temperature, apparently that also optimises the meringue stability. I used 2.5 dl caster sugar to 3 large egg whites and whisked them together on the lowest setting of my electrical whisk, while heating up the water in my bigger pot. It went foamy white fairly quickly, so I put the small pot into the larger one (and thus forming my bain-marie), while still whisking. I had the hob on quite low and the water never actually came to simmering point, just to be on the safe side, I did rotate the small pot to avoid heat pockets where the egg whites may cook into a solid lump. I kept whisking on the lowest level throughout and the mixture went very stiff. The idea is to get the whites cooked, but also in a foam and this provides the stability. Once the foam was very stiff, I took out the small pot from the larger one and filled up the piping bag and got to work, it was a joy, the meringue kept it's shape! Unfortunately, 3 egg whites resulted in three baking sheets full of rosette squirts of meringue and it was getting late in the evening on a school night, so I put two in the main oven and one in the grill/oven. At half-time I swapped the two in the main oven around, as I don't have the fan functionality to spread the heat evenly. At this point the top ones had gone a bit rosy. At the end of the hour, I switched off and left everything to cool in the oven. The next morning, when I took them out and was about to put them in a box, I found it was impossible, they were extremely sticky. Though tasty and Lundulph thought too. So I put them back in the cooker and did a second session of a few hours when I got back home, I forgot all about them. When I switched the cooker off, they all seemed to have dried nicely. This wasn't quite true, there was still some stickiness in most of them this morning, but it was possible to move them to a box. Not for giving away, but we'll make sure they don't go off. Hot tips for next time is to use the slow cooking setting, which should be even lower than gas mark 1. Possibly leave the meringues on overnight and on the lower level in the oven. Possibly also with a baking sheet on one of the higher levels, to prevent the meringues from going brown. Anyway, the rescue mission sort of worked. Taste-wise, these meringues didn't taste as sweet as the French ones I've made before, which does make sense since I used caster sugar this time, so per volume it's less than icing sugar. 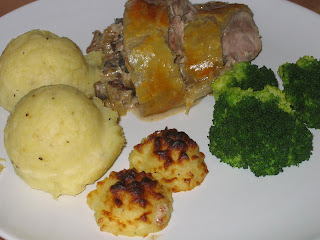 Yesterday for our luxury Sunday special dinner, I made "inbakad fläskfile", which would be "pork tenderloin en croute" in English. This used to be in Sweden what Chicken Kiev was in the UK and around the same time period too. In fact it's fairly simple to make and tastes very nice. The restaurant I worked in many years ago used to do this for most of the functions they did and sadly I never wrote down the recipe, so I had to make it up yesterday. On the whole, it worked well. Generally you'd use beef tenderloin which is more expensive, but the ones our butcher had were pork and looked nice, so I did them instead. You could tell that I hadn't made this in over 15 years. I had two good pieces of tenderloin, so made two rolls, the second one turned out a bit better, but still far from worth serving guests. In addition, Lundulph and I will now be eating this for some time to come, it was way too much for two people, but I've cut it up into portions and frozen, though I suspect this particular dish won't take kindly to this treatment. I had some for lunch today, reheated in the microwave, which made the crust ever so greasy, otherwise it was OK.
Heat up the butter in a pan. In the mean time pat the tenderloin dry with a kitchen towel. Brown the tenderloin all over, only enough for it to get a bit of colour. Remove from the pan and cover with salt and pepper, slice into 2 cm thick slices and leave to one side to cool. Heat up the butter in the same pan as used previously, don't wash in between. Fry the onions for a few minutes until it goes soft and a bit translucent, then add the mushrooms and stir occasionally until the released liquid evaporates. Add the creme fraiche, it'll melt and go thin, that's OK. Leave to simmer for a few minutes, then season and remove from the heat. Grease a baking tin. Place one sheet of puff pastry onto it, place the tenderloin in the middle, spread the mushroom-onion mixture evenly on top. Brush with egg white around the edges, then place the second sheet of puff pastry to cover the lot. If the sides are too wide, trim down. Whisk up the yolk with 1 tsp water and brush over the top. 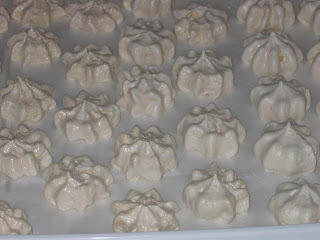 Trimmings of the puff pastry can be used for decoration. Bake in the oven for 20-30 minutes, depending on how thick the meat is. With this I made Delia's perfect mashed potato and steamed some broccoli. I also had a little play with the mashed potato and piped some roses and placed under the grill for a few minutes until the tips went golden brown. I have very vague recollection of my Mum doing this once very many years ago. They barely held together those roses, so I suspect I didn't quite do them right. In the restaurant they used to make a sauce with red roe, which sounds very odd, but complemented the tenderloin very nicely. I don't remember how it was done, so didn't attempt it this time. The big mistake I made this time was that I used two sheets of puff pastry in total for double the amount of everything else. So in order to get the meat and filling covered, I rolled the pastry. The first one I rolled straight onto the special silicone sheet I use when working doughs and this was a grave mistake as it stuck very well to it, I had severe difficulties prising it off and it tore badly pretty much everywhere. For the second piece, I left the plastic sheet on and also placed a piece of clingfilm under before rolling. This made wrapping much easier, but the pastry was so thin, that it tore anyway here and there. Not too bad though. And since my new cookery book arrived today - Le Cordon Bleu Complete Cooking Techniques - I've reached page 125, where this dish is described and called Beef Wellington. The stuffing is however completely dry and the piece of fillet is a lot thicker, so needs some pre-roasting. One very neat trick that I'll try next time is that the meat and stuffing should first be wrapped in a couple of thin crepes, which will prevent any juices penetrating the puff pastry and making it soggy. Also the crepes are made with herbs for additional flavour. Update 23 January: Yes, after some more googling, I found out that mashed potatoes piped and baked in the oven are called pommes duchesse and need an egg yolk or two in addition, I suspect to give them a more goldeny colour and to make the rosettes keep their shape better. There's plenty of mashed potato left now, so I'll give this one a go again. This turned out rather nice, despite all the mishaps I had with it. Once again I followed Rick Stein's recipe. First of all, making the aubergines stripey - I have a tool for making stripes in fruit and vegetables, but it turned out hard work. I tried Rick Stein's recommendation to use a potato peeler, but that was almost as tricky. I also tried using a vegetable knife, but it was difficult to control. I ended up using the veggie knife to score the aubergine vertically, then followed along with the stripe tool. Not sure if that was easier, but by this point I ran out of aubergines to stripe. Next I only cut them lengthwise, pried them open and spread some salt and left to drain, wondering how on earth I was going to get the stuffing in. Turns out I'd mis-read, I was supposed to cut out a wedge. While the aubergines were draining I made the filling. When it was time to add the tomatoes, I found out that I didn't have any. Gah! But I had a small can of tomato puree, which I put in with some water. Before attempting to stuff the aubergines, I cut out wedges and just about managed to fit in the filling. As with the lamb mince breads, the proportions weren't right, good thing I used two large onions instead of medium sized ones. I also squashed two fingers on the garlic press, which broke. Luckily I had a spare one. 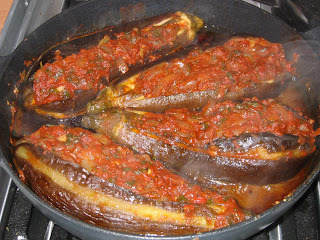 Finally, out of the 6 aubergines, I could only fit 4 in my pan, so decided to bake the last two, which is what my Mum does with Imam Bayildi (or имам баялда in Bulgarian). The 4 in the pan were done in just under an hour, while the 2 in the oven I left for about an hour and a half. I also drizzled the recommended amount of olive oil, by some strange coincidence, the aubergines didn't seem to soak it all up. Mu Mum also slices the aubergines and fries them lightly with very little oil, before lining an oven proof dish. So a lot less oil, a lot healthier. The whole thing was a bit of a hassle, but was quite tasty and I suspect it'd be even nicer with real tomatoes. Lundulph and I had one each yesterday. I hadn't prepared anything to go with this dish, and I kept thinking that some potatoes or some butter beans might be nice with it. Tonight, I baked salmon in aluminium foil and I covered it with some of the pepper paste I made on Saturday. That worked ever so nicely, the salmon took some of the heat off the pepper paste. With that we had steamed baby potatoes and half a stuffed aubergine - a very nice dinner for a working day. But I'll try my Mum's version next time, this stuffing of aubergines takes too much effort, so I'll only do it for dinner parties. Lundulph's verdict is that it works as a side with meat, or as a main dish for a vegetarian. I think I concur. Last year, I briefly got a glimpse of a couple of episodes of Rick Stein's new show Mediterranean Escapes. They were a very nice surprise to me, he's normally so into fish and I'm so not. But here he's picked out some specialities that seemed quite tasty. Well, it did help that I caught the episode in Turkey. And I was playing with the thought of buying the book. Luckily I didn't because I got it for Christmas. Tonight I made the Lahmacun and I've no idea how to pronounce it. 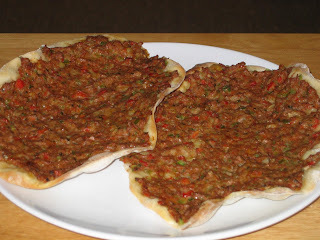 It's a Turkish light meal consisting of spicy minced lamb on flatbread. Once again I had to make some changes to his recipe - I didn't have the special Aleppo pepper and didn't have the recommended substitute Cayenne, so I used my treasured hot Hungarian paprika instead. It's not as hot, but adds a nice flavour. Also I trebled it, to be on the safe side. I was also surprised that plain flour should be used for the dough, its gluten content is normally not very good and it tends not to rise, but this was precisely the point. And it did swell enormously during the rising period. I think I used too small pieces of the dough for the flat breads and too much mince on each, so I only got 8 when the recipe was for 12. But I rolled the left over dough with my knobbly pin and got 6 pita-like soft flat breads in addition. Will see how they hold, this may be a solution to my long search for a recipe for Swedish soft flat bread, just need to add some spices. I used up quite a lot of flour in the kneading and rolling, should be less generous with that in the future. Certainly there's no need for flour on the baking sheets, they are non-stick. The mince mixture was difficult to spread on the breads, very messy. Might be an idea next time to do all the flat breads, before starting to bake them, rather than just do two at a time, while the previous lot is baking. I just about made it, but it was stressful. Finally we forgot the lemon juice in the end, only had parsley, but it was very tasty indeed. Lundulph had 2 and I had one, the remaining 5 I'll freeze, I don't see why this wouldn't work. On the whole, these are very close to what is called Princess toast in Bulgaria (принцеса), where a minced meat mixture is spread on a slice of bread and it's baked under a hot grill for a few minutes. I tried to do that after we'd been to Bulgaria, since Lundulph really liked it, but didn't succeed with beef mince, which we normally use. But this mixture with lamb mince might work here too, and it'll speed things up significantly too. I think it's because the lamb meat is a finer mince than the beef, not sure the reason for this. I'd rather use beef and will have to check with the butcher if they can do a finer mince with beef for me. In between things, I also made Turkish red pepper paste in preparation of another Rick Stein recipe from the Mediterranean book - Imam Bayildi, which is a dish popular also in Bulgaria - имам баялда. So I bought 6 Romano peppers - those fancy long bright red ones - specifically and also some fat red chillies from Waitrose. I blended them along with some sugar, salt, olive oil and water, then simmered in a pan for an hour until reduced to a thick paste. When I tasted it, it was way too hot to eat as is, but the flavour was precisely what Bulgarians call lyutenitza (лютеница). Which is really great, I'd asked my Mum for a recipe, but she didn't have one and reckoned it's too much trouble to make at home, easier to buy (if you're in Bulgaria or have access to a good Turkish shop). Traditionally in Bulgaria, lyutenitza is used as a spread, instead of butter. And despite the name meaning something spicy hot, it's not always that. In any case, I won't be putting in 3 big chillies with seeds and all when I make it for a spread. I'll also try using regular bell peppers, the Romano peppers are a bit pricey for larger amounts. Out of the amount I made (the chopped peppers and chillies filled the blender to the brim), I ended up with about 1.5 dl of paste. Rick Stein says it's called aci biber salcasi and it uses sun dried ingredients, I'll look out for it on my next run to the Turkish shop.